This past Saturday, the capital of Lativia, Riga, caught the limelight of not only local media but also reeled in TV, radio, press and fans from whole Europe. Why? 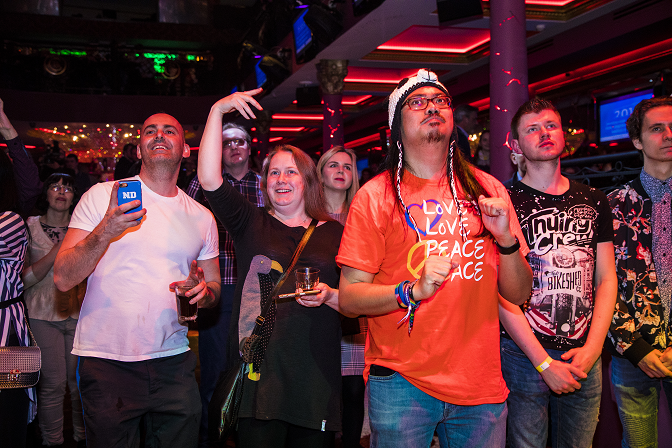 Europe’s biggest annual music event, Eurovision Song Contest, drawing millions of viewers to the screens, is nearing and it was Riga’s privilege to host Eurovision Pre-Party on March 24. Fans and journalists had a chance to see live performances of some of Eurovision 2018 acts. Latvian capital has been hosting Eurovision Pre-Party concerts since 2014, and this year saw four Eurovision 2018 hopefuls on the stage of Riga’s Crystal Club: Mikolas Josef from Czech Republic, Ieva Zasimauskaitė from Lithuania, DoReDos from Moldova, and Latvia’s own Laura Rizzotto. Though it was last year’s Eurovision motto: “Celebrate diversity!”, it can actually more true about Eurovision 2018. From pop to soft rock to metalcore to country, the upcoming contest has something to offer all music lovers. The first Eurovision contestant to perform was Lithuania’s Ieva Zasimauskaitė, whose velvet, relaxed high-pitched voice immediately created an aura of harmony and love around her. The tiny young woman didn’t need to do much on stage: her natural humbleness and melancholic notes made ‘When We’re Old’ an easy yet philosophical listening. There was something very honest and pure in the singer’s delivery, which “conquered” the listeners’ hearts. And talk about her skills at multiple music instruments, and an impressive medley of Ed Sheeran’s ‘Shape of You’ and TLC’s ‘No Scrubs’, which the audience totally didn’t expect! This year’s hopeful, Czech hip-hop singer, Mikolas Josef, whose Eurovision song ‘Lie To Me’ is still in Top 3 of Eurovision odds, sounded very different and fresh among pop performances before and after him. The performer crowned his song by jumping off the stage and dancing with a girl in the front row. Josef also chose to sing his most renowned track in the Czech Republic, politically-charged ‘Free’. The 22-year-old singer played the guitar, showed a bit of street dance and connected to the crowd in all possible ways. Hear our interview with Mikolas below and find out how he handles sudden fame back home, if girls chase him down the streets in Prague and what we can expect from his performance in Lisbon. Then Latvia’s finalist, Laura Rizzotto, took the stage and performed a dramatic, jazzy love ballad ‘Funny Girl’, telling the story about dragging too long in the friends’ zone, which one day results in your beloved one being “stolen” by some other, smarter girl. 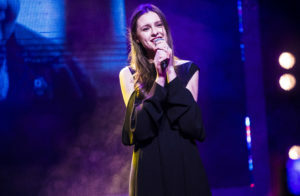 When asked by the host of the event, whether it was based on her personal experience, Brazilian-Latvian singer couldn’t help blushing, so the audience understood the song lyrics aren’t out of thin air. 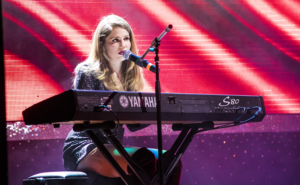 A special guest at Riga’s pre-party was Malta’s Eurovision contestant of 2015, Amber. Her powerful delivery of ‘Warrior’ live was top-notch, but that wasn’t it. Amber also performed a cover of the 2015 Eurovision winning track by Helena Paparizou ‘My Number One’, which finally set the crowd into motion. Finally, Moldova’s fun trio DoReDos got hold of the mics and the crowd was soon dancing along to their energetic Eurovision offering and other songs from own repertoire. As every Eurovision, the 2018 song contest has also got some rock tracks to offer. At the semi-finals we’ll hear a country rock song from the Dutch act Waylon (‘Outlaw In ‘Em’), enjoy impressive vocals of Albania’s Eugent Bushpepa (‘Mall’), see an entertaining rock duo Zibbz (‘Stones’), get into warrior/fantasy mood with Danish Rasmussen and finally bang your head to a metalcore act from Hungary, Aws. That’s right! Eurovision will welcome its first metalcore song onstage! Let’s see if the audience finds Aws awesome. Eurovision is only six weeks away (May 8-12) is it will unite 20,000 fans in this year’s venue in Lisbon, Portugal, whose contestant Salvador Sobral won last year. Keep your fingers crossed for your favorite contestants and tell us who you think deserves to win Eurovision 2018. You can see the Eurovision acts’ performances in Riga below. Do you like what we’re doing? If so, help us grow by sharing the article – this way we can keep providing you latest news and fun interviews with your favorite bands! Stay tuned with AlteRock Facebook and Twitter to never miss on the news about your favorite alternative music!